The John Thornton Young Achievers Foundation was delighted to support the Dorset Fire Cadets third and final stage of the current European Exchange to Cherbourg this summer. Lizzie Fryer, Daniel Eades, Dean Vincent and Jamie Cole were accompanied by instructors Phil Villain, George McConnell, peer mentor Callum Maile and Rosemary Locock, Community Safety Education Officer. The four cadets were specifically chosen to attend the exchange after demonstrating commitment, a positive attitude and willingness to work hard during the recent Wareham Cadet programme. Cherbourg has been twinned with the town of Bremerhaven since 1960 and with Poole since 1977 and it was because of these existing links between the three towns that the Fire Cadets Exchange Programme was possible. The Cherbourg exchange focused on Advanced Casualty Care and following the Poole Exchange in 2012 and the Bremerhaven Exchange in 2013 it celebrated the continuation of the partnership between the three towns. The Wareham Fire Cadets were welcomed to Cherbourg at a meeting organised by Cherbourg Town Hall and La Manche Fire Service which was well attended by local dignitaries and the local press. 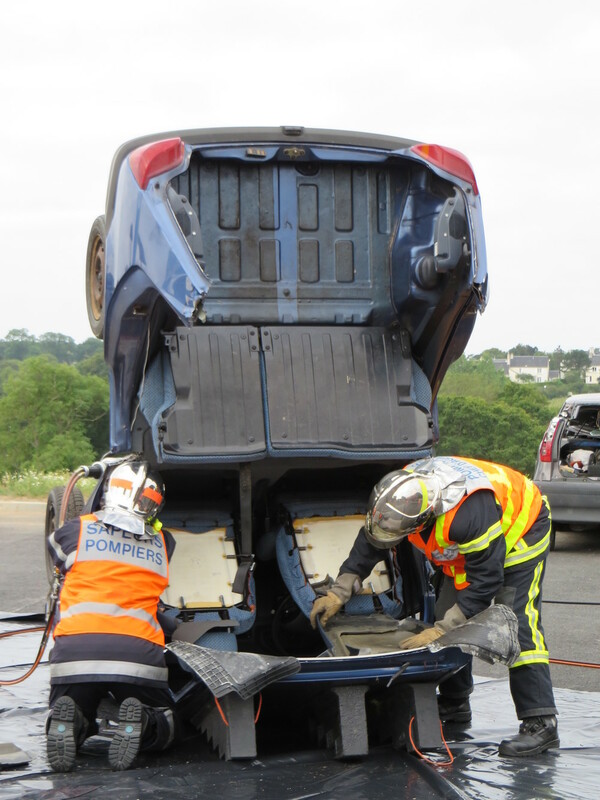 They then followed a busy five day programme of activities which included Firefighting and also discovering the town of Cherbourg and the county of La Manche. The cadets took part in water rescues, visited the helicopter rescue centre, the new training centre and enjoyed the opportunity to do some sightseeing together with a team building day at a Forest Adventure Centre. This year's event was of particular symbolic interest for the cadets as it followed closely the Commemoration of the 70th Anniversary of D-Day. An important part of the programme reflected this historic anniversary. The Wareham Cadets fully engaged with their French and German counterparts and took every available opportunity to practise their French and German language skills. There was a big emphasis on team building activities during the week and the Cadets were great ambassadors for the Dorset Fire and Rescue Service, maintaining a mature and professional attitude at all times. Dorset Fire and Rescue Service takes pride in it's work with young people across the county, encouraging participation from all ages and backgrounds and the Fire Cadets scheme has provided many great opportunities for local young people. The JTYAF is proud of it's link with the Dorset Fire Service and honoured to able to continue to support the further personal development of the Fire Cadets.